News Archive | CapitalCare | CapitalCare Group Inc.
CapitalCare Dickinsfield resident Alex Rattray is this year’s “Resident of the Year.” The award is a way for Dickinsfield’s residents to recognize an individual who is a positive role model and enhances the quality of life for those around them. 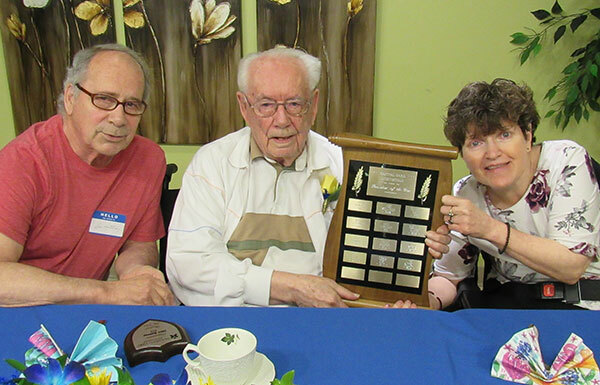 Last year’s recipient, Debbie Frey, presented the award to Alex at a tea held during Seniors’ Week, June 3-9. “Alex is a kind and welcoming person, who always keeps his doors open and we would like to thank him today for the difference he makes in the lives of other residents every day,” said Debbie. Alex was born and raised on a farm outside of Wainwright, Alberta. He left the farm to attend veterinary school at Guelph University, in Ontario. In 1946 he opened Edmonton’s first animal hospital – the Blue Cross Animal Hospital. During his career, Alex treated race horses and was as the track veterinarian at Northlands. Alex has been a dedicated volunteer throughout his lifetime and in 2006 received the Minister’s Seniors Service Award. Alex was married for nearly 71 years and has three children, 10 grandchildren and 21 great grandchildren. Alex, a resident on 3A (Aspen Lane) since November 2015, loves sports and has won awards in nearly all the sports he has participated in, many after the age of 80. He shares his love of games and sports almost daily with other residents with the help of his son, Don. Families help create spaces that bring back memories. 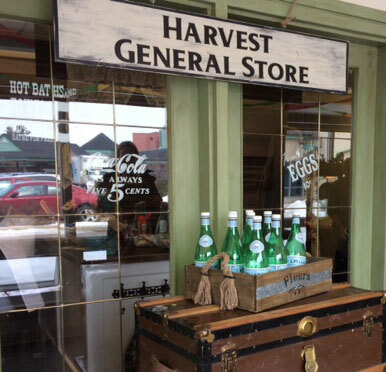 The grand opening of the Harvest General Store featured old-fashioned ice cream sundaes. 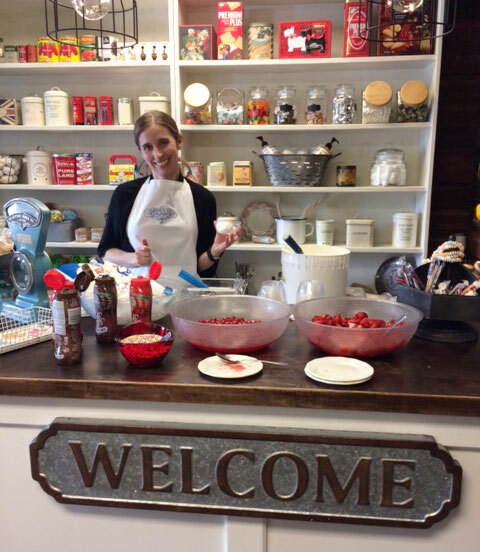 “I think all of us can remember places like this from our childhoods,” says Renee Rhodes, Care Practice Lead for CapitalCare Strathcona. "More importantly, our residents can recall these stores too". The opening of the General Store marks the third time under-used space at Strathcona’s Harvest House has been transformed to reflect CapitalCare’s shift towards a culture of person-centred care. As with the nursery and the calming room, the Tralnberg family were again instrumental in the development of this room, everything from helping with the faux wood painting to hanging reclaimed barn wood on the wall. They also donated the old carriage trunks and food scale, which came from a family farm outside Beaumont. 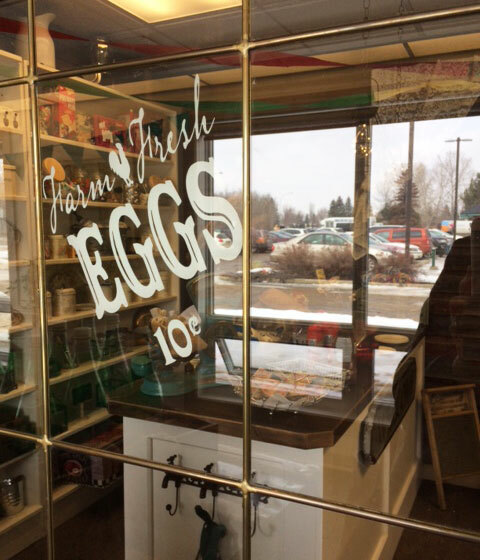 Another family member, Darryl Vincent, donated and built the store countertop, while staff and families also contributed by donating vintage items to create the look of an early 20th century store. These donations of items coupled with donations to the CapitalCare Foundation have made this room possible. “It has been absolutely wonderful to see the enthusiasm for this project from the families, visitors and staff,” says Rhodes. “Our residents now come down to the store and wander in, visitors and volunteers are often seen bringing residents from the other parts of the building. Please note: Artifacts in the store are not for sale. Strathcona’s gift shop is located in the main building by the administrative offices. CBC News December 23 2017 - When you put a decorator in a space with long hallways and blank walls, things are bound to happen — especially at Christmas. It doesn't matter that there is no budget. A piece of paper becomes a poinsettia; a cardboard tube transforms into a star-burst; a tree ornament is fabricated from a coffee pod. They all add colour and cheer. And at the Kipnes Centre for Veterans, the combination of homemade and heartfelt is in some ways even better than brand new. Read More. Edmonton Journal, November 10, 2017 - The Kipnes Centre for Veterns is home to more than 80 veterans. "Last week we were having a welcome tea talking about one of our paratroopers who jumped out of a plane 127 times". Read More. 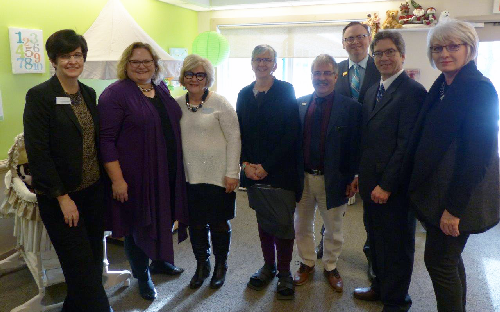 Health Minister recognized CapitalCare Strathcona as a centre of excellence in providing person-centred care. CapitalCare Strathcona has been recognized by the Alberta government for providing excellent person-centred care. Alberta Health Minister Sarah Hoffman made the statement on Facebook after a tour of the Sherwood Park continuing care centre which included a stop in the Harvest House nursery. The nursery was created earlier this year, the brainchild of Care Practice Leader Renee Rhodes, who worked with residents’ families to transform disused spaces into stimulating, person-centred environments. A man cave, spa, bistro and calming room were also part of the project. “The idea behind these environments to give people living with dementia a place to go, to stimulate memories, and build relationships,” says Liz Tanti, Site Director at CapitalCare Strathcona. Karen Cavanaugh’s mother Lorraine has been a resident of Harvest House for over three years. Karen says it was heartbreaking for her to visit and find her mom and other residents with nothing to do, just staring at blank walls. In February, Karen attended a resident/family council meeting where the idea of the nursery was being discussed. She posted to a Facebook page of local moms asking for donations of baby gear for the project. The response was so overwhelming, she had to turn donors away. Everything from the crib, to the strollers to clothing came from the community and took just four days to acquire. Once the room was set-up, residents immediately started interacting with the babies, and with each other. See the video here. Renee believes the babies and the nursery have reached residents at the level of their feelings. “They may not be able to remember what they are supposed to be doing, but they instinctively know how to be around a baby,” said Renee. Thanks to the Cavanaugh family and everyone who contributed to this wonderful project. Long time volunteers, Frank Coady and Rudy Chowaniec. 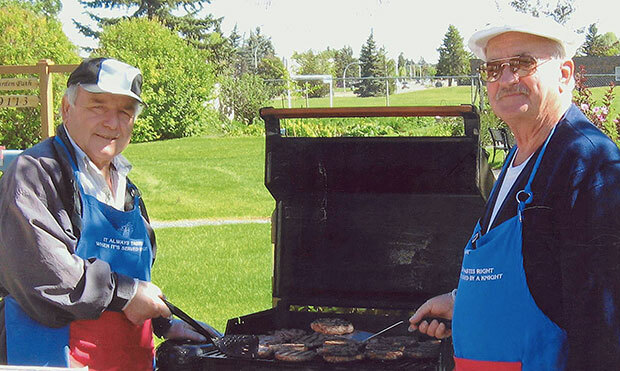 The “Kings of the BBQ” have hung up their aprons. Long-time volunteers Frank Coady and Rudy Chowaniec, together with their wives Theresa and Minette, retired after a combined service of 46 years and over 6,300 hours. “It was always our pleasure to come here," said Theresa Chowaniec. "It is a joy to see how well-loved the residents are here, so cared for by the staff.” Added Minette Coady, “It’s true what they say, happiness really is doing something good for someone else." Rudy and Frank are members of the Knights of Columbus - St Christopher Council, a service group that has funded enhancements at both McConnell Place North and CapitalCare Dickinsfield. Their wives often came with them to volunteer, and held prayer groups. We will miss them dearly and wish them well in retirement. 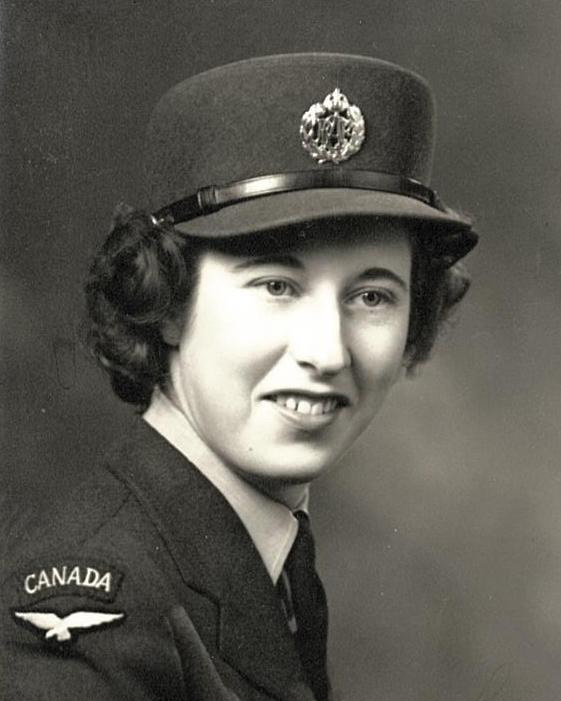 We were proud of our uniform, blue, and if you didn’t leave Canada you didn’t get the Canada badge,” she said, tracing her finger over the shoulder badge...Read More. 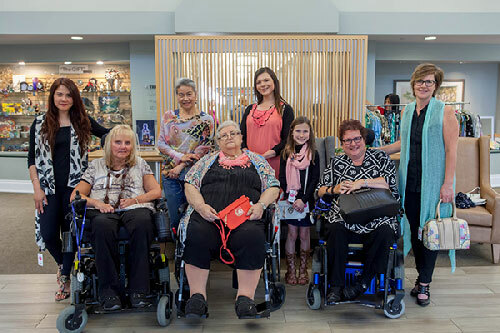 On May 24th, the ladies of CapitalCare Strathcona and Pieces Passion for Fashion teamed up to put on a fashion show that won’t soon be forgotten. After a champagne reception, participating residents assembled two different outfits for themselves, which they then modeled for an audience of staff, residents and friends. Once the show was over, residents and friends spent the rest of the evening shopping from the beautiful selection of fashion pieces and enjoying baked treats, courtesy of Renee Rhodes.The event was co-hosted by Liz Ellett, a resident of Laurier House Strathcona, care practice lead Renee Rhodes and site director Liz Tanti. Four Korean War veterans were honoured by South Korea with Ambassador for Peace Medals. 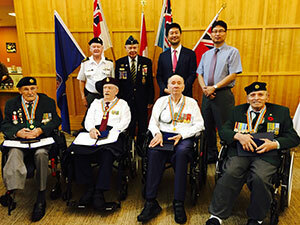 Edmonton Journal - June 2 2017 - Kangjun Lee, representing the Consulate General of the Republic of Korea in Vancouver, presented the medals to the veterans in Edmonton’s Kipnes Centre for Veterans, where they all live. Samuel Frischknet, William Greeley, Austin McClure and Kenneth Storey were recognized in front of family and friends, members of the Canadian Forces, and fellow veterans. 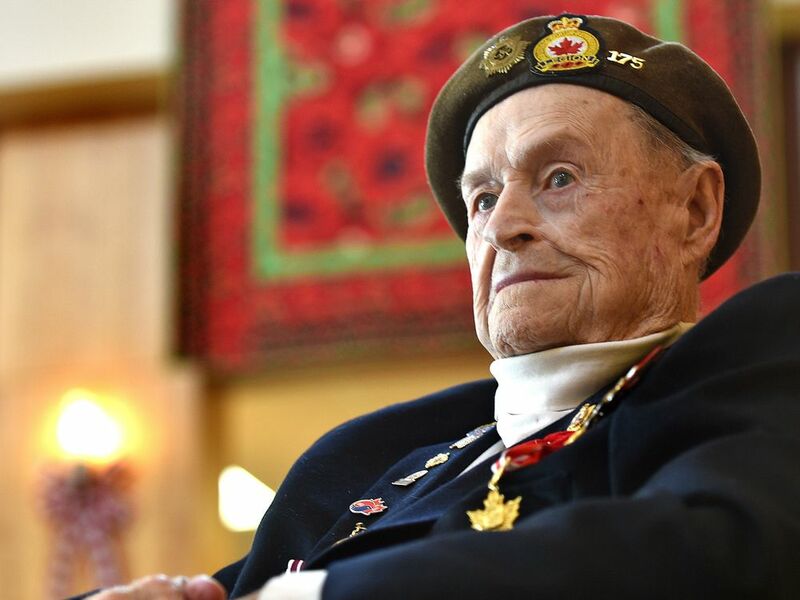 “When Canada called in 1950, these four gentlemen lost no time in answering the call to duty to defend South Korea and the free world,” said John McDonald, president of the Edmonton unit of the Korea Veterans Association of Canada. 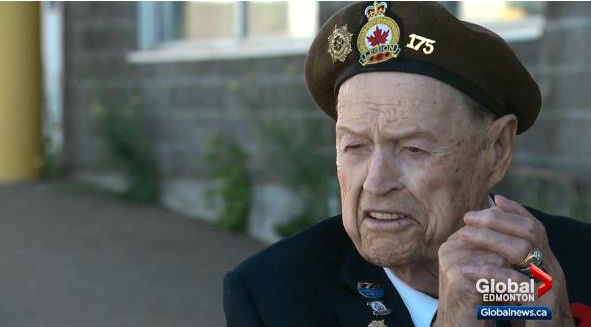 McClure, 90, was a member of the Royal Canadian Engineers who served in Korea from 1952 until the end of the war. He was joined Thursday by his wife, Gail, and good friend Henry Tischer, who served in the Royal Canadian Air Force. McClure said he was honoured to be receiving the medal and was at a loss for words. Lee spoke to the veterans and the crowd before presenting the medals. He said even though 67 years have passed since the start of the war, the respect and gratitude from the Korean people has not diminished. The peace medal can be presented to any Canadian who served in South Korea from 1950-55. The war (1950-53) began when North Korea invaded its southern neighbour. The UN came to South Korea’s assistance, and an armistice was eventually signed. The two Koreas have never signed a peace treaty, and are still technically at war. About 27,000 Canadians fought in the war and 516 lost their lives. The peace medals were originally given to veterans who were able to return to South Korea. The honour has since expanded to veterans who cannot make the long trip. McDonald previously received the peace medal himself for serving in the war. Click here to watch video of the medal ceremony. 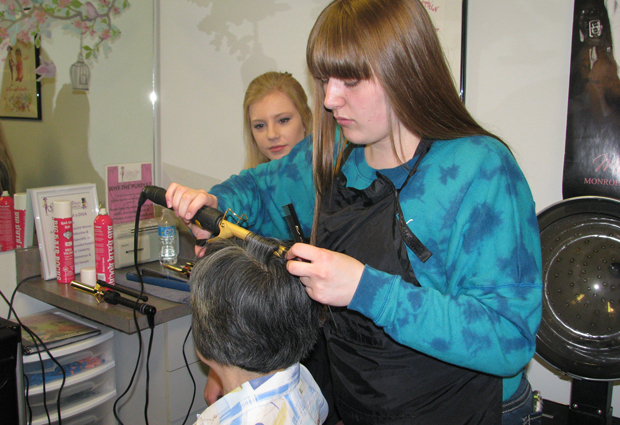 Cosmetology and photography students from Jasper Place High School came to Laurier House Lynnwood May 12 to help some residents shine. Designed with Mother’s Day in mind, 24 students performed manicures, hair styling and makeup, before taking residents’ portraits. Yvonne Szott, recreation therapy assistant at Laurier House Lynnwood worked with Jamie Imeson, JPHS teacher, to create a fun and relaxing atmosphere for the first “Let Us Help You Shine” event. Paper flowers in purple, yellow and green decorated the walls and residents enjoyed cookies and punch while waiting for a variety of services from 24 students who pampered them with more services they are used to receiving in the long-term care centre’s in-house salon; a duet of student musicians sang acoustic pop songs in the dining hall for the enjoyment of all residents. The event was a big hit with students, who graduate from high school next month and can challenge an exam that would allow them to work in the esthetics industry. Memories of kindness and compassion stand out for long-term care evacuees. They are gone, but not forgotten. Lydia Kleppe and Naomi Mercer were two of nine long-term care residents evacuated from Fort McMurray to CapitalCare Lynnwood a year ago. A photo of the city now hangs over the spot where the two roommates were reunited after being separated in the evacuation. 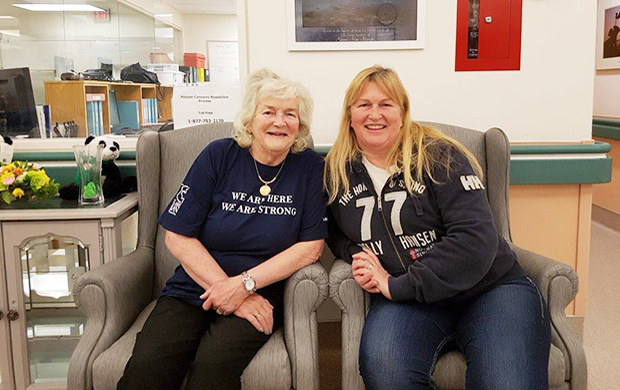 A twin of the photo also hangs on the long-term care of the Northern Lights Regional Health Centre, forever joining the two units in remembrance of the tragic circumstances that brought them together. Long-term care residents were airlifted out of Fort McMurray and arrived with nothing but the clothing they were wearing. What they found in Edmonton was nothing short of a second family. CapitalCare Foundation, with donations from listeners of CFCW Radio, organized toiletries and clothing for them. When they went back, The Foundation provided suitcases so they could take their belongings with them. Some of those clothes still hang in Lydia’s closet today. Lydia, Naomi and all but one resident returned to Fort McMurray last July. Staff returned a month ahead of the residents to pack up residents’ belongings, and residents returned in small groups so that staff could assist them to sort through them. Naomi has since passed away, and Lydia now lives in a private room on the long-term care unit. 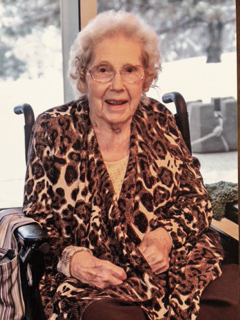 Jean Jamieson was 97 years young when she was photographed for the cover of CapitalCare’s Laurier House brochure. On January 21, she celebrated her 100th birthday. Constance Jean Jamieson (nee Morgan) was the child of English immigrants who settled in Edmonton near the beginning of the First World War. The newly completed High Level Bridge was the marvel of the time allowing the amalgamation of Strathcona, where the family lived, and Edmonton just across the river. Jean was born and raised in Bonnie Doon, in an era where water was supplied by a communal well, where coal (for heat) was delivered by teams of horses, and where sanitary services were situated “out” by the alley for ease of pickup by the “honey wagon.” She attended King Edward Park and Rutherford schools, and spent her recreational time roller skating in summer and skating in winter. She met her future husband, Allan Jamieson, through the community league, and was married during the Second World War years. Jean supported her husband in his growing livestock business, cooking, cleaning, canning and chauffeuring her two children and their friends. Coming from a musical family, she loved to sing and passed on her love and appreciation of music to her own children, as well as her six grandchildren, and now two great grandchildren, newly arrived. She moved to the Crestwood community and lived on Candy Cane Lane for over 20 years. 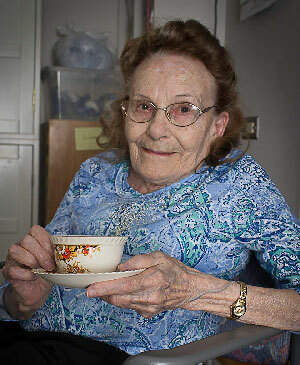 When her mobility became greatly reduced due to arthritis, she moved to Laurier House Lynnwood in 2006, and remained active, conversive and thoughtful of others. Jean attributes her longevity to the fact she has seldom been ill during the past ten decades. Her son adds his mom’s kindness, good humor and positive attitude has played a role in her long life. “Her genuine interest in people has sustained in her an incredible vitality and enthusiasm for life,” says David Jamieson. February 16, 2017 - Fort Saskatchewan resident Scott Day travels to Edmonton every day to visit his wife of 63 years, who has Alzheimer’s. He said he knows of seven people who have had to move to Sherwood Park or Edmonton to have the level of care someone with dementia needs. Read More. November 11, 2016 - Dr. Ken Abbey, a resident of the Kipnes Centre for Veterans, drops the puck for captain Connor McDavid at the Edmonton Oilers game on Remembrance Day. Retired Sergeant Abbey flew 34 missions over Germany during World War II. He was a tail gunner with the Lancaster Bomber Crew WW2 of the Royal Canadian Air Force. See it on SportsNet. Click here for video. Dougald Miller lived at CapitalCare Norwood for 16 years. September 26, 2016, Edmonton Journal - Lesley Miller was working at a hair salon in a small town in Scotland blissfully unaware that the man she would marry was her neighbour. Dougald Miller moved to Canada and it was only because he came home to visit his parents that he eventually met Lesley and they fell in love. A year and half later, she joined him in Westlock, and they were married. On Saturday night, after finding him improbably 34 years ago, Miller lost the man she describes as her soulmate. August 21, 2016, Edmonton Journal - It was a major win for Capital Care last week when some 400 fans dined in the end zone at Commonwealth Stadium and raised about $50,000. Scoring big for one of the largest public continuing care organizations in Canada were three award-winning chefs: Brad Smoliak, chef and owner of Kitchen; Steve Buzak, the Royal Glenora Club’s chef and Zinc’s executive chef David Omar. Savvy food-loving fans warmly applauded the chefs’ local sourced barbecued feast at Feast on the Field. An increasing number of people are being diagnosed with dementia, but there is no cure. “People with dementia may not speak one word, but when they hear a song they will sometimes start to sing and live in the moment,” she says. Lois Bergot (nee Cooke) was born on May 27, 1916 to an Alberta pioneer family - Emma (nee Boyd) and T.Edmund Cooke - who arrived in Grande Prairie by horse and cart in 1911 and established a sawmill. Naomi and Lydia, who met at Northern Lights this past January, have been inseparable ever since. The two women share a room in the continuing care unit and have forged a very strong bond. Feast on the Field - A spectacular success! March 23, 2015 - Lois Davis, 90, is working hard at CapitalCare Norwood’s restorative care unit in Edmonton. The facility provides a transition place for patients to stay who don’t need to be in acute care in hospital but aren’t ready to go home. December 23, 2014 - Santa and a group of Edmontonians 'adopted' residents at McConnell Place North, delivering present for each senior, as well as singing Christmas Carols. Click here to view pictures. Alberta’s top employers, and one of Canada’s safest employers. Manuel DaCruz became unable to work and was forced into an unexpected early retirement. 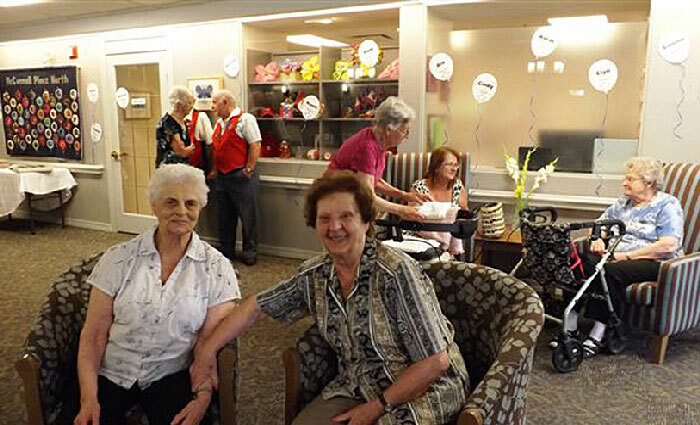 March 1, 2014 - Adult day programs are growing in popularity across the country as governments recognize the advantages to supporting the frail elderly to age in place. One model for such delivery is the Comprehensive Home Options of Integrated Care for the Elderly (CHOICE) program in Edmonton, Alberta. August 16, 2013 -Hundreds of servings of ice cream were dropped off at CapitalCare Norwood on Friday, August 16. The donation came through the Dairy Queen located in Sherwood Park. dedicated to improving the quality of life for the people it serves. May 18, 2013 - Anonymous "yarn bombers" brightened the day for seniors at a north Edmonton care facility by lining their garden fence with over a hundred crocheted sunflower. features photos and an article based on the displays we produced for our 50th anniversary year. December 2012 - For most people, meals are an important part of the day; in residential care facilities, the take on added significance. Not only do meal times mark the passage, they are often the highlight. Edmonton Sun, July 31, 2012 - Capital Care is bringing long-term care residents a taste of home. Canada’s largest public continuing care provider unveiled a new home-style food menu and a revamped dining room at its Grandview location Tuesday. National Post, May 29, 2012 - Two Kipnes Centre for Veterans residents share their secrets for living a century. Axiom News, January 06, 2012 - It has long been recognized that the kitchen is the heart of any home, but for far too many elderly residents in long-term care, comfort can be hard to come by in the sterile dining halls and kitchens where their meals are served. In mid-December, Edmonton’s CapitalCare — Canada’s largest public long-term care provider — took a grand step towards bringing comfort back into its oldest kitchens and dining rooms with the launch of a newly-renovated gathering space at one of its homes. It’s not often that someone leaves their life savings to a hospital. But Walter Hubschmid was more than happy to give what he had to the centre where he spent his final days. With no wife or kids of his own, he chose to give his $250,000 in savings back to CapitalCare Norwood. Hubschmid was a former farmer who lost his battle with emphysema in November of 2009. Globe and Mail, July 12, 2011 - Lillian Clyne is spending the afternoon knitting a scarf at CapitalCare Norwood in Edmonton, a one-stop health-care and recreational centre for the elderly with chronic medical conditions. Twice a week, a bus picks up Mrs. Clyne at her home and takes her to the centre, where she is assessed by medical staff and participates in her favourite activities – knitting and painting ceramics. CapitalCare Grandview (Edmonton, Alberta) held a piano concert featuring jazz pianist and Senator Tommy Banks on June 8, 2011. The Rotary Club of Edmonton West generously donated the grand piano to the long-term care facility. Edmonton Sun, March 13 2011 - As the tune of Amazing Grace flows out of a guitar, terminal cancer patient Neville Nero is taken to another place for a brief moment where he can forget he is in palliative care. Music therapist Carla Rugg made her way around Edmonton’s CapitalCare Norwood Palliative Hospice Sunday afternoon much like she does every week. Her job is to bring music, comfort and some relief to families and patients that are facing death. Alberta Health Services, March 23 2011 - “Now I’ve started to live my life. It’s changed. I could hardly lift my hands before — and now I can be more independent,” says Jerry Onyschuk, 60, who has MS and uses a wheelchair. CapitalCare Grandview is home to 145 elderly and disabled adults who need 24 nursing care and services. The Rotary Club of Edmonton West supports this centre through donations that enhance quality of life for residents. Their most recent donation is a brand new grand piano, valued at $32,000. This video shows the joy it brought to residents who assembled in anticipation of the grand piano arriving. Edmonton Journal, February 14, 2011 - The February 14 event was sponsored by Edmonton Opera and CapitalCare as a fundraising collaboration between continuing care and the arts. View the Edmonton Journal photo gallery. On November 5, 2010 members of Edmonton Opera paid a surprise visit to the CapitalCare Kipnes Centre for Veterans. 120 veterans were served pancakes by members of the 408 Tactical Helicopter Squadron at the annual Capital EX breakfast at the Kipnes Centre for Veterans. Edmonton Examiner, April 8, 2010 - Helen Lavender doesn't let retirement stop her from keeping busy. This avid volunteer and former teacher spends most of her week volunteering at a variety of organizations, one of which is CapitalCare Strathcona. CapitalCare Grandview orthopedic rehabilitation program helps surgery patients return home sooner. Alberta Health Services Innovation Improving Care, April 1, 2010 - Grace Foster is home again, sooner than she expected. The 77-year-old had surgery on her fractured right hip last month. After two weeks in an Edmonton orthopedic rehabilitation program, she returned to her home in Beaumont. Alberta Health Services Innovation Improving Care, February 2010 - Edmonton program catches problems before they require emergency care. At 85 years old, Frank Blackwell has just discovered how much he loves dominoes, card games and the interesting stories of new friends. He discovered these passions after being referred to the CHOICE program at CapitalCare Norwood in Edmonton. Edmonton Sun December, 2009 - Struggling with multiple chronic ailments, long-term care resident June Evans hasn't seen or heard from her children or grandchildren for more than 10 years. So when a brightly-coloured bag stuffed with Christmas gifts from strangers was delivered to her bedside recently, she was almost in tears. Care magazine Winter, 2009 - Continuing care today provides opportunities in leadership, innovation and relationships. This feature showcases the variety of work of three different Licensed Practical Nurses working for CapitalCare. Edmonton Journal October 19, 2009 - David Younie and Shadow were destined to be good friends. He loves cats and she is one, and both live at the Strathcona Alzheimer Care Centre. February 6, 2008 - Life or Death: Who decides? Panel of experts discusses treatment decisions at the end of life at the People & Progress Conference. “I’m told that progress and change can be measured in baby steps, and my response is ‘I don’t have time for baby steps." 4-Year old raises $3K for "Grannies and Grandpas"
Izzy participated in her first Run for Brave 4 years ago - from a jogging stroller pushed by her mother. Izzy has been training and fundraising for this year's 5K walk since December. Donald Oborowsky, co-founder and CEO of Waiward Steel, presented CapitalCare Foundation with a cheque for $100,000 towards improving dining rooms for people living in CapitalCare long-term care facilities. July 31 2012 Edmonton – On the eve of revealing the second phase of dining room renovations to its long-term care centres in Edmonton, CapitalCare - the country’s largest public continuing care provider - showcased its new home-style meal program, serving up lunch to media and special guests. April 29, 2010 - Palliative care hospice like dying at home. Family gives back to hospice for care and support received. August 21, 2009 - Everyday heroes run for the brave on August 22.